But only one of my varieties, given the name Rabbi Samuel, seems able to tap into what little sunlight and heat are still at hand. The flavor of fruits that ripen on the heels of a spate of cold, rainy weather falls flat. But whenever sunlight fuels enough photosynthesis in the leaves and warmth in the greenhouse for at least a couple of days, a few fruits will swell and soften, their rosy insides then sweet and richly flavored. Next year’s fig crops are also on my mind. 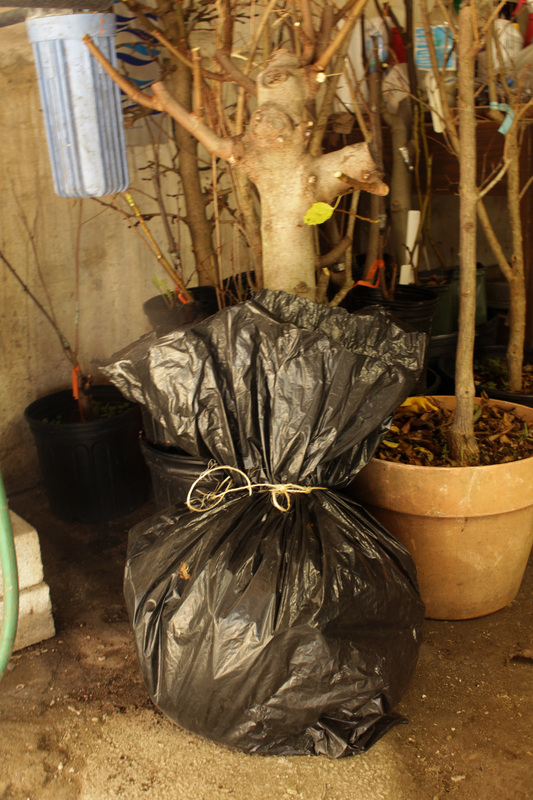 Greenhouse figs no longer bearing good-tasting fruits get lopped back to 3 to 4 feet high. That dramatic pruning will coax vigorous growth next spring on which new fruits will be borne. More dramatic pruning would coax even more vigorous growth, but the figs on that new growth would begin ripening too late. Potted figs have also been pruned and moved to my barely heated basement where temperatures below 50°F will restrain growth until outdoor temperatures in spring warm enough so that the pots can be moved back out. Figs are subtropical plants that, when dormant, tolerate temperatures down into the 20s, or lower. If kept too warm in winter, new growth begins indoors. That new growth is tender and easily burned by slight frost or even bright sunlight when moved outside. Potted figs are difficult to muscle around; mine need to be carried through three doorways and then down narrow stairs to the basement. So a potted fig needs to be kept in a reasonably sized pot even though that allows for only a reasonable amount of growth which, in turn, allows for only a reasonably sized crop. I worked my way around this problem by taking one of my potted figs, a Kadota, out of its pot and planting it directly in the ground in spring. Theoretically, eager roots reach out into the surrounding soil, enough to support more growth — and larger crops — than if restricted within a pot. Another plus with this method is that no watering is needed beyond an initial drenching. My success, thus far, has been limited. Kadota may requires too long a season to begin ripening any fruit outdoors here. Still, success might come once the plant gets used to its routine, or I’ll use this method with a shorter season variety such as Brown Turkey. 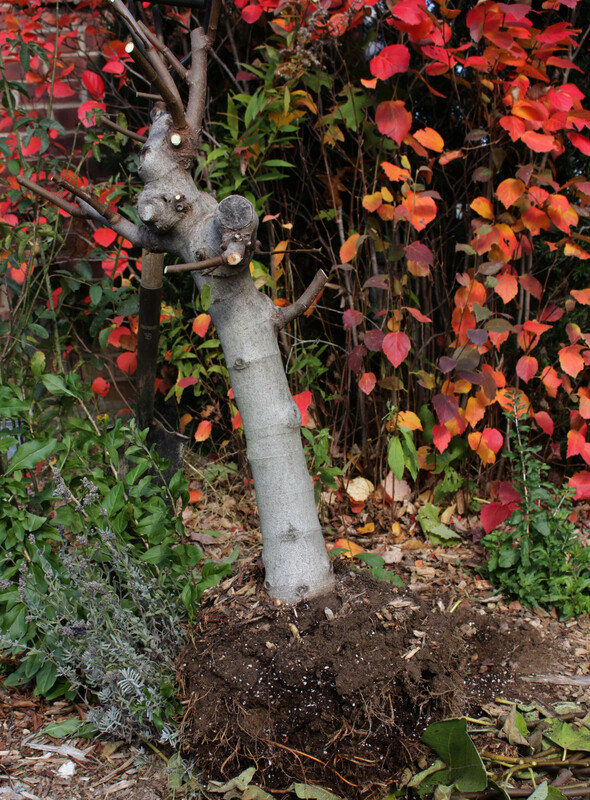 The time to dig up a planted out fig is anytime before temperatures dip below about 20°F. Or sooner, if the plant has lost its leaves and gone dormant. Continuing the Mediterranean theme (is this some primal attraction to a Garden of Eden? 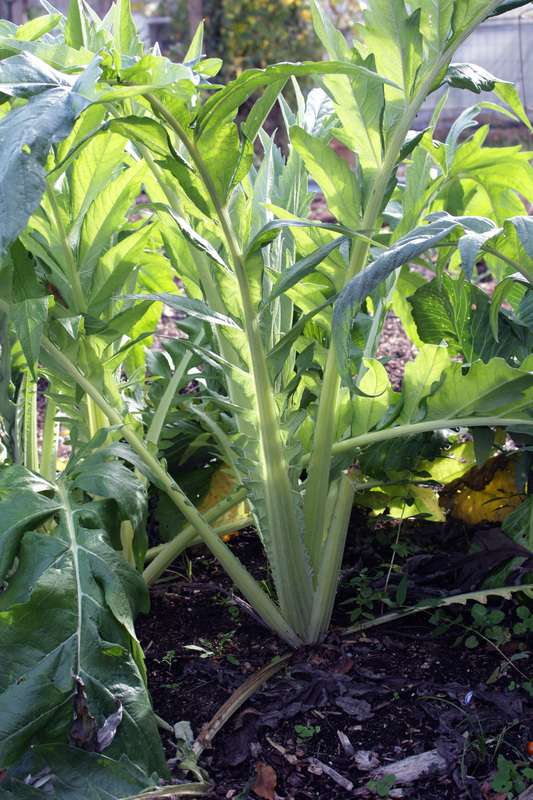 ), I wrote back in May about growing, with reservations, Gobbo di Nizza (Hunchback of Nice) cardoon. In my garden many years ago, cardoon proved to be an enormous, spiny, bitter-tasting vegetable. 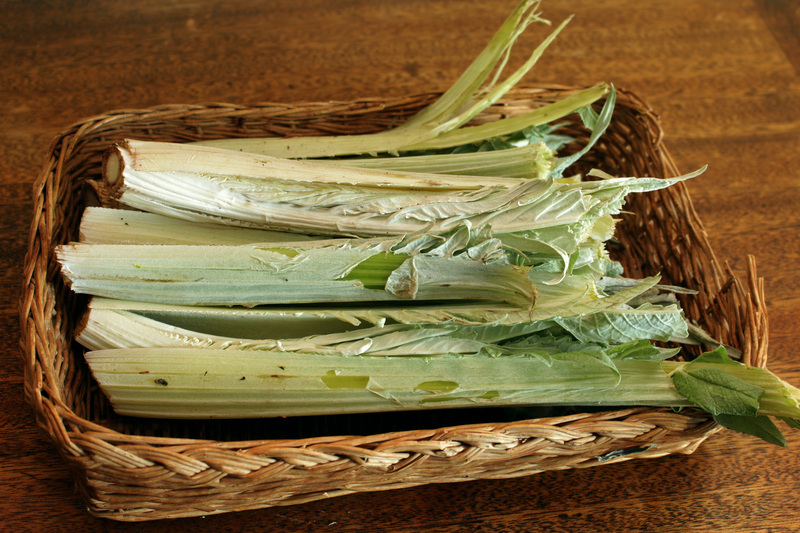 But that wasn’t Gobbo di Nizza cardoon. First off, Gobbo di Nizza is not spiny. It looks spiny but the soft “spines” don’t bite. This is an impressive-looking plant, something like a giant thistle (which it is, as is the closely related artichoke, botanically speaking), a whorl of gray-green leaves (very Mediterranean) soaring almost 4 feet high. I tasted Gobbo di Nizza a month or so ago and was very unimpressed with its bitter flavor. Blanching, which is blocking out sunlight, is a way that the flavor of vegetables such as endive and chicory is mellowed. Some folks blanche cardoon. So I gathered together Gobbo’s leaves, secured them in a tight bundle with a wrapping of twine, and waited a few weeks. Once I had harvested the leaves, removed the blades, and pared away the stringy flesh, I was left holding large, pale leaf stalks, the stalks looking much like celery on steroids. Chopped into 1” pieces, and drained after being boiled for 15 minutes in salted water, Gobbo di Pizza had a smooth, artichoke-y flavor, quite good. Perhaps it was the olive oil and home-grown sun-dried tomatoes I drizzled over them. Earthy Flavor: What am I, a Worm? Beets are too earthy in flavor for my palette, and it’s not my imagination. That earthy flavor is from geosmin, a substance that is actually also present in soil! I like my earthiness in the soil, not my food. Varieties differ in their geosmin concentration, with cylindrical varieties and the striped variety Chioggia being highest. 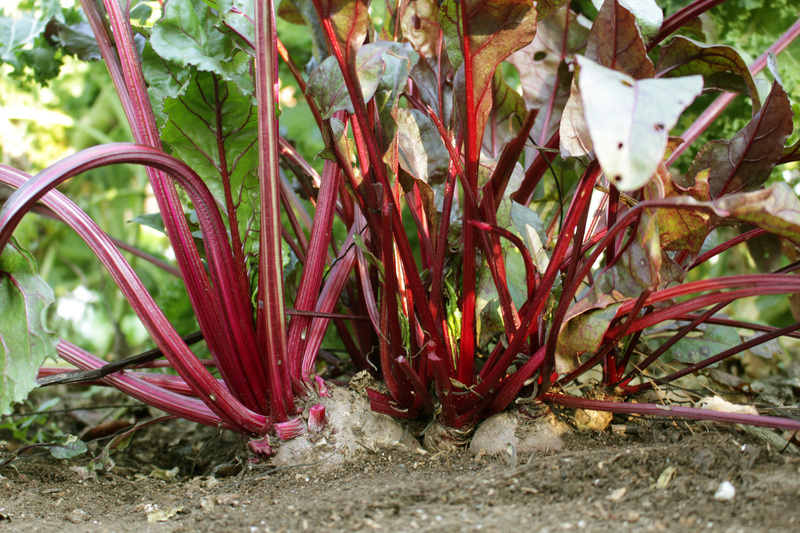 This past season I was duped into growing beets again. I grew the old, low geosmin variety Detroit Dark Red, but still found it too earthy. Most were given away. The few left await vinegar, horseradish, or mustard to tone down their earthiness. This entry was posted in Fruit, Gardening, Planning, Vegetables and tagged beets, cardoon, fig, geosmin, Rabbi Samuel. Bookmark the permalink. Trackbacks are closed, but you can post a comment. Lee — I always seem to learn something from your posts. My wife used to complain about the earthy taste of beets – which I did not understand. Now I do. Thanks. I am spending some time in Florida and I just love figs – I love the leaves. I’ve seen a few. I would grow that cardoon just for its looks! Although your dish sounds delicious. Interesting about geosmin. It is perhaps the reason why many people don’t like beets, but I do – especially wrapped in foil with a garlic clove and a drizzle of olive oil on the grill. I have a lot of different fig varieties. Fortunately my climate is mild and I don’t need to move my figs inside in winter, no frosts here. However, my climate is mild in summer too, and frequently cloudy and rainy. Only the early figs can ripen all the crop, and Kadota is not a good variety for that purpose. On the other hand, it is a very sweet variety but not a rich taste, in my opinion. Why don’t you try a very early, very productive and excellent taste variety like Ronde de Bordeaux (don’t confuse with Violette or Rouge de Bordeaux)? It is the earliest variety and it will not disappoint you. Thanks for the suggestion. Ronde de Bordeaux is on my list of plants to get. I did once have Violette de Bordeaux and was unimpressed with the flavor.